If a white man walks into a school with a rifle and opens fire, that one story alone will trigger panicked calls for gun control, spark nationwide marches, launch an all-out war against the NRA and fuel the national media machine for months. But apparently, if an Iranian woman with a handgun walks into a business and shoots it up, that’s worth about a day. Probably because this isn’t really about gun violence. It’s about an agenda. 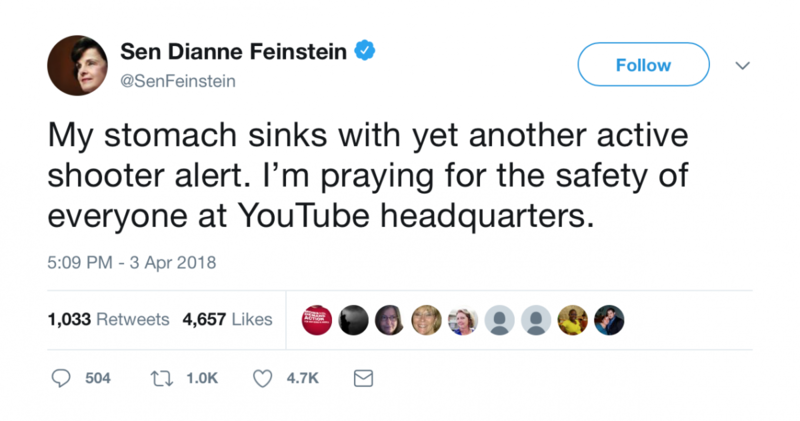 Here's the latest fine example of this ridiculously transparent dichotomy: on Tuesday, news broke that an active shooter was loose inside YouTube’s headquarters in San Bruno, California. And it took all of about 5 minutes to figure out who it was. It turns out the shooter wasn’t a white guy with a rifle, which is the left’s favorite bogeyman when it comes to mass shootings. Nope. It was an Iranian female PETA activist in a headscarf with a 9mm handgun who’d decided she was pissed at her job. And that just does not fit with the gun control narrative. Everyone notice how that whole story just fell out of the news cycle like a lead balloon? Man, that was quick. It was major news for about a minute, but when it turned out the shooter was a Middle Eastern woman with a handgun, the media dropped that story like a bad habit. Then it came out that the gunman was a Middle Eastern tree hugger and everything went crickets. 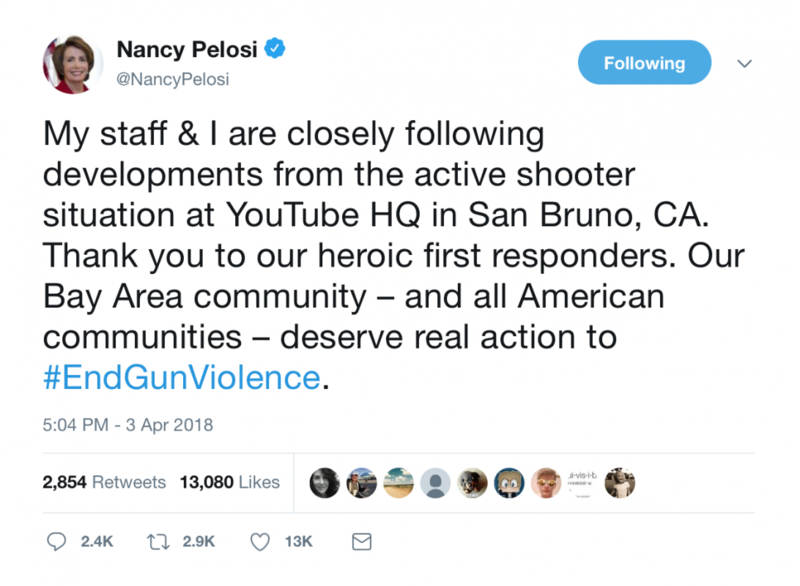 When news of an active shooter first broke, Nancy Pelosi and Dianne Feinstein both immediately tweeted that they were monitoring the situation closely and renewed their calls for gun reform. When it turned out the shooter was a foreign chick armed with a handgun, they suddenly found better things to do with their time. It’s interesting which shootings the leftist media decides to focus on, and which it doesn’t. If gun violence is really the issue, they’d be concerned with all of it, right? But that never seems to be the case. If a shooter lights up a gay nightclub, it’s all over the headlines for weeks. But a guy guns down a bunch of country music fans in Las Vegas, and we still don’t know why he did it, what his girlfriend did or didn’t know, or why the police didn’t respond faster. That story just got buried, and no one seems to care that we still have no idea how or why it happened. A man shoots up a church and gets put down by an NRA instructor with an AR-15 and that story lasts about a day and a half. On the other hand, the Parkland shooting’s been in the news for two months. I guarantee you that had the YouTube shooter been a white male wearing a MAGA hat armed with a rifle, we’d be talking about it for the next five years. But it was a foreign woman in a headscarf with a pistol, so the media’s already aborted that mission. Because this isn’t about gun violence. And it’s not about finding solutions. It’s not about victims or mental illness or figuring out what policies might actually help stop these crazy people. It was and has always been about pushing a narrative, and focusing solely on those stories that fit that narrative. And this one didn’t.